The double glazed units within all of the Duplus rooflight product range feature what is known as Low E, or low-emissivity coating to the glass itself. This is a transparent, microscopically thin metallic coating that works in two ways to economise heating energy. The dual action coating reflects the majority of heat back into the room thereby reducing the heat loss through the rooflight, and allows heat and light from the sun (known as passive solar heat gain) to pass through. These properties thus reduce the demand for energy in order to heat your home. Indeed, our thermally efficient rooflights are so good at keeping the heat in that in some climatic conditions, the outer pane of the double glazed unit can get cold as it is no longer being warmed by what would otherwise have been wasted heat from the inside, resulting in the formation of external condensation on the outside surface of the glass. This can be seen as a positive sign of having a superior insulating rooflight. In its simplest form a double glazed unit is just two panes of glass with a sealed air gap between. This sealed gap or cavity, being the normal atmosphere from the factory where the double glazed unit was made. To improve the energy efficiency of double glazed units, air is substituted for argon gas which is a colourless, odourless, non-flammable, non-reactive, inert gas with a 34% lower thermal conductivity than air. This results in the heat conductance between the inner and outer panes of the double glazed unit being significantly lower than with air alone. Obviously if the argon gas escapes over time or the double glazed unit is manufactured initially with insufficient argon gas, then the stated performance of the double glazed unit would be severely compromised. Indeed at a level of 80% concentration the additional thermal performance of the argon gas is lost. In order to ensure high percentage argon gas fill rates and low leak rates, Duplus only purchase double glazed units from suppliers who have invested in the very latest double glazed unit production lines that seal the two panes of glass together within an argon filled chamber and that are independently audited to fully comply with BS EN 1279 – the standard that defines the rules for gas filling and gas leakage rates. The spacer bar of a double glazed unit is the perimeter hollow frame which separates the two glass panes. The spacer bar is bonded to the glass panes via a primary and secondary seal, creating a sealed cavity for the argon gas. The hollow spacer bar is filled with a desiccant to absorb any residual moisture within the cavity in order to prevent condensation from forming within the finished double glazed unit. Traditionally, double glazed units have been manufactured with a perimeter seal made from aluminium. Aluminium being light, strong and relatively inexpensive was ideal for forming into a wide variety of shapes and sizes. However, as Building Regulations required ever improving thermal performance, aluminium spacer bars within double glazed units have been replaced by low heat-conductive materials that keep the edges of the sealed unit warm. These materials are known as “warm edge” spacer bars, they act as a barrier to heat loss which results in lower overall energy bills and are used in every Duplus Roof light product. The contemporary look of our structurally bonded rooflight range is created, in part, by having no beads or clamping plates on the top surface of the rooflight glass. Whilst a contemporary look is achieved it does expose the edge seal of the double glazed unit to UV light. The edge seal of normally manufactured double glazed units would breakdown when exposed to UV light and overtime the unit would begin to mist up. To prevent this issue affecting our products, the double glazed units contained within all Duplus structurally bonded products incorporate a secondary unit seal made with Dow Corning’s 3362 high performance insulating glass sealant which is fully compatible with the structural and weather seal silicones used within our product range. Duplus Roof lights incorporate 2 panes of toughened glass within the construction of the double glazed unit as standard. The thickness of each pane of toughened glass is determined by the overall size of the pane required but is either 4mm or 6mm thick. Toughened glass is made from annealed glass treated with a thermal tempering process. A sheet of annealed glass is heated to above its “annealing point” of 600°C; its surfaces are then rapidly cooled while the inner portion of the glass remains hotter. The different cooling rates between the surface and the inside of the glass produces different physical properties, resulting in compressive stresses in the surface balanced by tensile in the body of the glass. These counteracting stresses give toughened glass its increased mechanical resistance to breakage when compared to normal annealed float glass, and are also, should in the unlikely event of it breaking, cause it to produce small, regular, typically square fragments rather than long, dangerous shards that are far more likely to lead to injuries. Toughened glass also has an increased resistance to breakage as a result of stresses caused by different temperatures within a pane. Duplus Roof light’s incorporate toughened glass which is manufactured to BS EN12150 – Thermally toughened soda lime silicate safety glass. Note toughened glass should not be used above swimming pools or where the glazing is at a height over 13m above floor level – if you are at all unsure as to the suitability of our products for your installation please speak to Gavin on 0116 2582834 for clarification. Only Duplus “Walk on” structurally bonded rooflight products are considered non fragile. As standard our Rooflight products are manufactured using clear double glazed units. However, we are able to offer a wide range of glass solutions to suit our client’s requirements. A popular choice is to incorporate a body tinted glass such as “blue tinted glass”. A body tinted glass is principally used to minimise solar radiation that enters a building, keeping it cool from the inside. Glass Body tinting is produced by adding small amounts of metal oxides to the float or rolled glass composition. These small additions colour the glass bronze, green, blue or grey but do not affect the basic properties of the glass except for changes in solar energy transmission. The body tinted colour of the glass is homogeneous throughout its thickness. Most float glass contain small amounts of iron oxide, this produces a green tint usually only perceived when the glass pane is viewed ‘on edge’. Additional iron oxide is introduced to produce green body tint, cobalt oxide for grey tint, selenium oxide for a bronze tint and additional cobalt oxide for a blue tint. 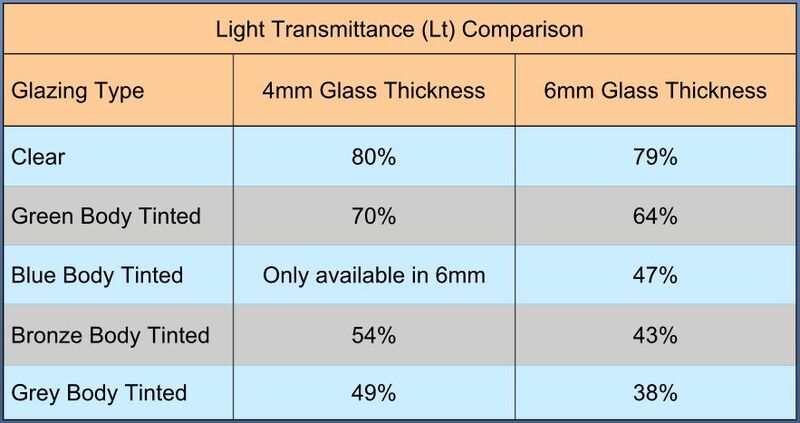 Different body tint colours offer different levels of Light Transmittance (LT).The LT Values given below are for guidance/comparison only, they are approximate and subject to the glass thickness and the ultimate glass supplier. Duplus Roof light products featuring body tinted glass also incorporate argon gas cavities, warm edge spacer bars and both the internal and external panes of the double glazed unit are toughened glass. Please speak to Gavin on 0116 2582834 for prices and further information. Solar control glass is a high performance coated product that reflects and radiates away a large degree of the sun’s heat while allowing daylight to pass through the rooflight. The indoor space stays bright and much cooler than would be the case if normal glass were used. 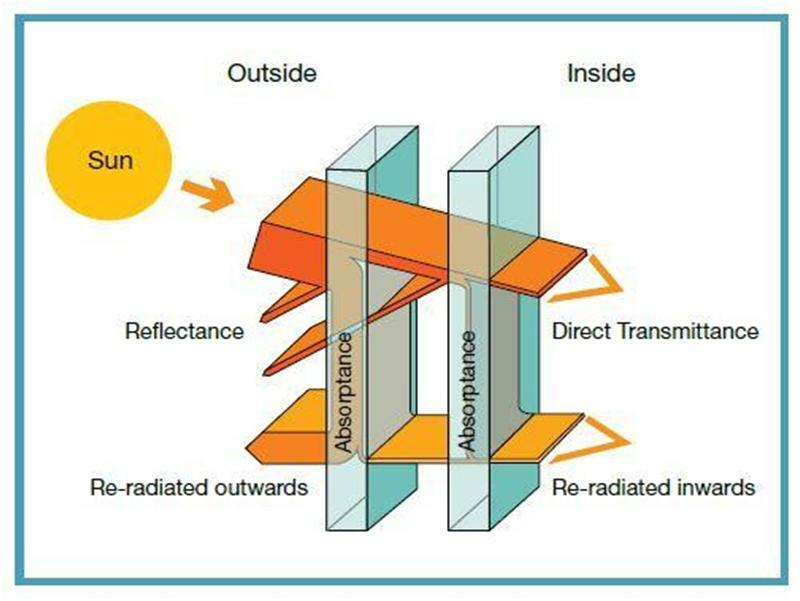 Solar control glass incorporates invisible layers of special materials on the glass which have the dual effect of allowing sunlight in, while repelling solar heat. 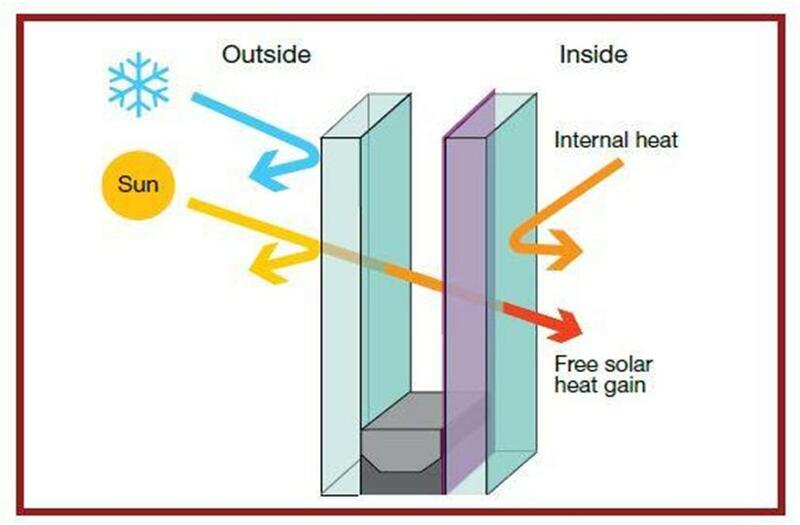 In addition, solar control glass units incorporate both Low-E and solar control properties, to maximize insulation in cooler periods and solar control properties in summer. Duplus Roof light products featuring Solar control glass also incorporate argon gas cavities, warm edge spacer bars and both the internal and external panes of the double glazed unit are toughened glass.